A University of Illinois at Chicago professor calls for an independent study on the impact of public school closings on schools that take in displaced students. Through interviews with 20 people from three receiving schools, Pauline Lipman reports complaints about inadequate resources, increased discipline problems and academic challenges. A CPS spokesman says the district is working on a study. Some lawmakers have called for a moratorium on closings until such a study is completed. The Noble Network of Charter Schools snares a $4.2 million grant to open a new high school devoted primarily to math and science. The school will be located in Humboldt Park and named after Exelon Corp. Chairman John Rowe, who contributed $2 million (matched by Exelon), and ComEd Chairman and CEO Frank Clark, who donated $200,000. Students will attend school an extra month each year. The school also plans to launch an after-school or summer math and science program for middle-school students. 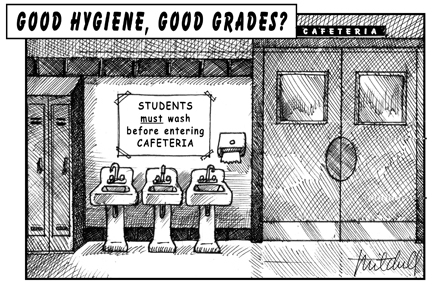 While lawmakers have yet to take significant action on school funding reform, the Illinois House passes a law that would require CPS officials to make sure that students wash their hands before eating meals at school. Rep. Mary Flowers of Chicago proposed the bill, saying schools aren’t doing a good job of teaching kids the importance of hand-washing, which state law already requires. A CPS spokesman says the law isn’t necessary. The bill was passed 100-14 and is now headed to the Senate. The state Board of Elementary and Secondary Education has approved nine new charters to open next fall, bringing the number of charter schools in the city to 40, according to the Feb. 14 New Orleans Times-Picayune. One of the new charters will be run by Chicago’s United Neighborhood Organization. Eight applications were turned down. Meanwhile, the state plans to open up to 27 more schools by next fall through its Recovery School District. Of the 56 schools that have opened since Hurricane Katrina struck, the Recovery District operates 20, the Orleans Parish School Board manages five, and the remaining 21 are charters. The 56 schools serve about 28,000 students—half of public school enrollment before Katrina. Students in restructured, district-run schools made higher test score gains than students at for-profit schools that received far more funding, according to the Feb. 1 Philadelphia Inquirer. The private managers got up to $750 more per pupil than regular public schools—in all, $90 million more. A study by the Rand Corp. and a local non-profit tracked the gains of 41 privately run schools, compared to 21 restructured schools that got extra resources. A spokesman for the non-profit says private management should be scrapped. District leaders say the private managers were handed some of the city’s worst-performing schools and could not be expected to post higher gains. However, all of the schools were initially low-performing. Andrew Rotherham, co-director of the research and policy group Education Sector, who spoke at a Feb. 22 policy luncheon co-sponsored by Catalyst, Business and Professional People for the Public Interest and the Illinois Network of Charter Schools. For more information about the luncheon series, click here. What is the timeline for announcing the next round of school closings? Will the criteria for selecting schools change? How will the board ensure that children are transferred to better schools? Although last year’s school closings were announced in January, CPS as yet has no timetable for announcing this year’s round. The district blames the state’s delay in releasing test scores. David Pickens, deputy to CEO Arne Duncan, anticipates technical revisions to the closings policy, but not tougher criteria. Jackie Leavy of the now-shuttered watchdog Neighborhood Capital Budget Group, calls the delay “an unfortunate back-pedaling” and speculates that the district postponed the announcement in part to sidestep controversy prior to the mayoral election. State Rep. Cynthia Soto recently introduced a bill that would force CPS to announce proposed closings six months prior to the School Board’s vote, and to hold public hearings in affected communities. The bill would also give displaced students the right to enroll in a school making “adequate yearly progress” under the No Child Left Behind law. You can find Soto’s bill online at www.ilga.gov. While Gov. Rod Blagojevich has increased education funding overall, the state’s share of education revenue has declined since he took office. In 2003, the state contributed 36% of education funding, down from 39% the previous year, according to the most recent annual report of the Illinois State Board of Education. In 2005 (the latest year for which final data are available), the state’s share fell to 34%. Over the last two decades, state funding reached its highest point, 42%, in the 1987 fiscal year under the administration of Jim Thompson. The lowest point, 32%, was in 1996 under Jim Edgar.